Today is Rosh Hashanah, the Jewish New Year and the first of the High Holy Days. To be more precise, Rosh Hashanah actually begins this evening, since the Jews have traditionally begun a new day at sunset. This holiday takes place on the first two days of the month of Tishrei in the Hebrew calender. Because the Hebrew calendar is a lunar calendar, the dates wander a bit in our Gregorian calendar. This year it takes place on September 9-11. The New Year is celebrated for two days because of the difficulty of determining the precise day of the new moon. Today is Yom Kippur or the Day of Atonement, the holiest day of the Jewish calendar. On this day Jews ask for forgiveness for the sins they have committed against God and their fellow men over the past year. They fast for 25 hours on this day, starting about 20 minutes before sundown the previous day and continuing until evening of the day. Jews also attend Synagogue services for much of the day and there are five services in contrast to the usual three prayers on most days and four on Sabbaths. After the last service, they recite they Shema, “Hear, O Israel, the Lord is our God, the Lord is One”, and blow the Shofar. Here is the Biblical description of the Day of Atonement. 1 The LORD spoke to Moses after the death of the two sons of Aaron who died when they approached the LORD. 2The LORD said to Moses: “Tell your brother Aaron that he is not to come whenever he chooses into the Most Holy Place behind the curtain in front of the atonement cover on the ark, or else he will die. For I will appear in the cloud over the atonement cover. 6 “Aaron is to offer the bull for his own sin offering to make atonement for himself and his household. 7 Then he is to take the two goats and present them before the LORD at the entrance to the tent of meeting. 8 He is to cast lots for the two goats—one lot for the LORD and the other for the scapegoat. [b]9 Aaron shall bring the goat whose lot falls to the LORD and sacrifice it for a sin offering. 10 But the goat chosen by lot as the scapegoat shall be presented alive before the LORD to be used for making atonement by sending it into the wilderness as a scapegoat. 29 “This is to be a lasting ordinance for you: On the tenth day of the seventh month you must deny yourselvesand not do any work—whether native-born or a foreigner residing among you— 30 because on this day atonement will be made for you, to cleanse you. Then, before the LORD, you will be clean from all your sins. 31 It is a day of sabbath rest, and you must deny yourselves; it is a lasting ordinance. 32 The priest who is anointed and ordained to succeed his father as high priest is to make atonement. He is to put on the sacred linen garments 33 and make atonement for the Most Holy Place, for the tent of meeting and the altar, and for the priests and all the members of the community. Since the Temple was destroyed in 70, the ceremonies pertaining to the Most Holy Place cannot now be performed. 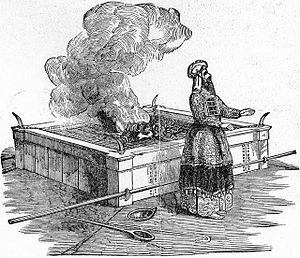 Instead Jews remember the Temple ceremonies in the Avodah service. Orthodox and most Conservative Synagogues have a detailed recitation of the Temple Ceremony. Here is a detailed description of the Yom Kippur Services. Yesterday evening at sunset Rosh Hashanah, the Jewish New Year and the first of the High Holy Days began. This holiday takes place on the first two days of the month of Tishrei in the Hebrew calender. Because the Hebrew calendar is a lunar calendar, the dates wander a bit in our Gregorian calendar. This year it takes place on September 13-15. The New Year is celebrated for two days because of the difficulty of determining the precise day of the new moon. This evening at sunset Rosh Hashanah, the Jewish New Year and the first of the High Holy Days begins. This holiday takes place on the first two days of the month of Tishrei in the Hebrew calender. Because the Hebrew calendar is a lunar calendar, the dates wander a bit in our Gregorian calendar. This year it takes place on September 24-26. The New Year is celebrated for two days because of the difficulty of determining the precise day of the new moon. I have been negligent in not mentioning that Rosh Hashanah, or the Jewish New Year, began at sundown yesterday. This year the holiday falls on September 16-18. I wrote about the origins of Rosh Hashanah last year here. It is a little late but here is the shofar blowing.